When it comes to the treatment of trauma, our work often centers on our clients’ feelings and sensations . . .
. . . and sometimes, those sensations can present as physical pain. In the video below, Peter Levine, PhD shares a powerful story of how he helped a man trace the source of his unremitting back pain – all the way back to where it began. Take a look – it’s just 4 minutes. 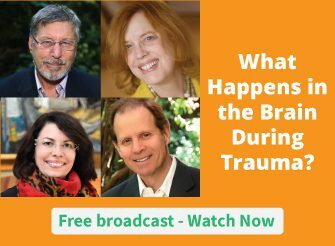 For more on how to work with traumatic memory, be sure to check out the Treating Trauma Master Series. You’ll get insights from: Peter Levine, PhD; Bessel van der Kolk, MD; and Pat Ogden, PhD. As an art and journal therapist I see great relief for clients (and myself) when the body gets outlined and then areas of pain are colored in, then used as a choreographic map for movement, and then a dialogue with both hands. The Body speaks with the non dominant hand accessing the right brain, and the interviewer (aware self) writes with the dominant hand. I see brain integration and certainly experience it when I use the method. I healed a life=threatening, incurable disease this way, which is how I discovered the method. This was a most helpful treatment method and I plan to include this concept in my work. Our body is wise and THE Healer, we just have to allow ourselves to trust our body’s wisdom and explore within what must be brought to our awareness to be release. I use body awareness techniques every day with clients and myself, and just by being present with the body in its fullness physical healing can happen. Hi Lucia,i just came back from therapy and we tried to work on my body since the trauma it’s there.But i cannot feel anything,i am very aware of my feelings and my inner body,i can feel the “freeze”but in this case when we talk about my childhood and my therapist says to focus on my body,i cannot feel anything.Why is that? Of late, I have had clients who have found that naming an experience has the ability to change that experience; sometimes the experiences has become more acute (using SUDS), but trusting in our relationship enabled the process to improve once the client has accepted that avoidance no longer has long-term viability. Looking the experience in the eyes, as one said, seemed to increase confidence in her ability to relate differently to events associated with the initial experience. As a Core Energetics therapist, after some body movement, I have the client focus on the pain area and mindfully stay with it. On their own, they tend to ignore or move away from it, even make it bad, scolding it. When they explore, often they find images or emotional memories there, that we can work with. I find the finishing of movements that were once initiated most useful, like P. Levine’s client running from the tiger, but also boxing, kicking, speaking up etc. Thank you for this series! I also do something similar, I am a Survivor, therapist and healer, I help them tune in then use healing to remove the energy into the universe or whatever their equivalent is. With a child part I might use a magic carpet, we put the memory in the carpet and then we shake it out into the universe. If they are afraid of letting it go I use containers or pillar boxes, anything that can be airtight sealed, then we put them a second into the future so no one can see it and the memory can’t come back but it’s still there. I put a one-way slot in it so they can add any residue that comes up between sessions. I just want to Thank You for your aware thinking. That is what this Trauma Series represents to me – the more effective treatment and general awareness of how linked throughout our human system Trauma impacts, and a better acceptance that Trauma responses are normal to human beings and their response behaviour better diagnosed allowing the trauma victim to not feel shamed/crazy, which I believe would have more trauma victims seeking psychological treatment more readily. Thank you again, Peter and Ruth! Every client that I’ve worked with who have experienced trauma, especially years of childhood trauma, have had some type of physical pain and or a some type of chronic illness. I’m having more success in assisting these clients in being more in touch with what they’re experiencing in their bodies, along with integrating experiences such as yoga and meditation, which have been helpful in their healing. I still need a lot more experience in finding what works both in emotional and physical experience. These presentations are helpful. So in this example, Peter allowed him to feel the experience, talk through the image and situation and then the pain was less? Or did i miss how he finished this particular method off? Thank you for sharing this most valuable & insightful information nicabm members and all other posters here. Trauma isn’t a conscious decision, so ANY experience can result in pain. Pain is our brains threat avoidance process. ANY physical (sensory) or emotional input the brain is receiving when a threat is experienced can trigger a response. The response is often pain. I help clients reorganize sensory input associated with pain, disassociating the trigger and response. The associated emotional aspects typically fall by the wayside as well. You put it very succinctly. How would someone deal with a traumatic sexual abuse experience which occurred at the age of two, of which he has no memory? I do this with clients without realizing it was done by others. So Cool. Do you have any recommendations of resources to learn about the original version of yoga that you talk about? That’s quite interesting the example u used for the Peter with Back pain. It made me think of my own back pain which startrd a fall from incident of assault. Making question myself if my situation could be similar. After having CbT therapy I managed to deal with some terms of situition but there is a part of the memories that stuck in me and each time I am forced to fac? them I experience intense pain and emotional distress which I have right now as I write this comment. My question is that will I ever get over this coz it seems to be taking all I had despite my resilience to find and face. I find your video so real for me maybe coz I am a therapist and a victim of trauma. I hope you will try EFT with a certified EFT practitioner. EFT for trauma has been shown to be effective with pain and many symptoms of trauma. Visit Nick Ortner’s website. I personally witnessed his successful use of EFT with a man who had chronic back pain related to trauma. In fact a video of this demonstration (it was at a workshop about 4 years ago) may be on Nick’s website. I am a practitioner and have used EFT for pain relief. Do check it out. Makes sense. I think we know this, but we become trapped, and we need help to get out of the trap. I am interested in whether there is a connection of this information and substance abuse. I would think so, as you may know it can be just a form of self soothing & denial; escaping what to them is too unbearable. Thus, they aren’t really conscious of the associated painful emotions & experience. This energy is then stuck somewhere in their energetic being. I feel as though a trauma creates a block/freezing of the energetic flow; like a short circuit of sorts. I work with children and they often can’t identify the actual traumatic event however we work on what our body remembers. I wonder if this help. From my own experience I only realised that I could not visit the entire memory of the incident for a long time. Through therapy I still failed to go there all I recall of the memory was feeling like I was blind and could not see much but tiny fleeting bits and pieces of event. My strongest sense was feeling the physical contact impact which remained the memory of entire life . You would think an adult would recall more but still can’t get why I become blind each time I try to remember these memories and the sudden pain that comes with it even thought it’s past becomes so real as if it’s current. So you can imagine for children they may even fail to explain like an adult complicating the matter further. Hope this may help from an adult experience. I am sorry to hear. I am not surprised by your comment that you think since you are now an adult (more time has passed creating some distance in the intensity of this too painful past experience) that you should be able to recall more. However, in reality when trauma is stuck (too hard to process; it is outside you acceptable world boundaries at that time) that part of you remains the age it was when traumatized. It is still too hard for you to process; and thus, you protect yourself by becoming blind. In actuality the mind’s consciousness knows no time; you can relive good and bad experience in your mind as if it is happening right now. Try it with some pleasant experience & see if you don’t feel & experience the actual sensations you did as in the past. Much love & healing to you Engie. I wonder what the weather was like when the truck was ambushed, to go further into the memory for more healing. Somehow this is important! Been working with a couple now for two years. Let’s call them Thomas and Caroline. Two physicians, devoted parents with a four year old girl, a two year old girl and, as of last month, a new baby boy. Whenever Thomas feels pressured by Caroline, it could be a simple comment about how he’s managing the kids or a mild criticism, he either withdraws or blows up in anger. It’s the worst whenever he’s out driving with Caroline and the kids. Once he threw an empty IV bag at the driver of a another car who cut him off. When Thomas was four years old, his parents out driving with him and his baby sister Hannah, were hit by another car. The accident left Hannah with permanent damage in her motor cortex. She’s now 30 years old and lives in an assisted living home. Thomas has been on Lexapro for the past three years which helps alleviate his chronic back pain. Over the past six months, I’ve been helping him get more mindful of his emotions and what he’s feeling in his body using what I’m learning in sensorimotor training, especially watching Pat Ogden working with clients in her wonderful videos. I’ve finally convinced Thomas – with Caroline’s blessing – to come in alone for some EMDR. In our last couple session, he carefully inspected my NeuroTek equipment and decided he’d like to work with tapping and possibly the ear phones. Eye movements turn him off. So I’ll see what Thomas brings in next week; his images, emotions and where he’s feeling them in his body. Maybe we’ll get to a float back of the four year-old in the car. Maybe a cognitive interweave of Doctor Thomas speaking to his four year-old part. Or even a future template of his emotional reactions to Caroline. Like him, rationally speaking, I’m a sour optimist and a happy pessimist. But unlike him I feel like a happy optimist, bubbling with enthusiasm especially in my heart, impatient to help him. Also unlike Thomas, I both know and feel that I’ll have to be patient. Is this what’s left in me after much effort to reprocess my own struggle with hyper-arousal? Would Pat Ogden call this an Act of Triumph? Imagine the vast number of mirror neurons that have fired between Thomas and me in the past two years. Imagine what we’ve wired together! Not like the roommates at Wellesley. A different kind of synchrony. Hello, I work with children ages 5-11 in a school setting with a high ratio of at-risk students. On a daily basis I help students that are in raged with anger and also numb with apathy. I am sworn at, kicked, and hugged daily. The children I see have have so much trauma in their short years that they are easily triggered by the smallest request. I am searching for more tools to help children self regulate and get in tune with their bodies. I cannot afford the classes and am asking for a grant to view the master classes and learn tools to help the children at my school in Michigan. Thank you! Integrated Learning Systems offers an evidenced based, Safe and Sound Protocol that has proven to be highly effective with hyper-aroused children. Please check out the I.L.S. website. The Safe and Sound Protocol also seems to be helping this shrink deal with his own hyper-arousal. Thank you kindly Cathy for your love and dedication to these sweet souls in great need. There has been a lot of success with the use of yoga to get children to become more mindful of their bodies. Many places on-line offer some guidance like the Dr. Deepak Chopra Center. Some places/states offer free classes; Canada offers free yoga & mindfulness practices (www.newleafyoga.org) and AZ a reflection room & nature trail walks (www.turnanewleaf.org) come to mind. I hope this at least gets you some kind of helpful direction. Love, Peace & harmony to us all. I use bodywork through breath concentrating on the painful area. It is through the breath that the person have insight as what the trauma cause the pain. It has worked well in my practice. Thank you for the great series. As soon as I can rule out any medical cause, I will use this exploring/ focusing on the site of pain. Hope you will be able to address dissociation as well. It’s the fear of more pain that stops so many people allowing themselves to explore the sensations within their bodies and minds. I have used yoga for many years but more recently have discovered how the most ancient of yoga concepts are the forerunners of modern psychological and psychosomatic therapeutic practices. Yoga, as mostly taught nowadays as a physical practice, is beneficial for the body and will support mental change but the concepts as originally outlined over 2000 years ago have enabled me to help myself and others to go deeper into the long-stored memories, tensions and pain of past trauma. The interesting material coming from NICABM reinforces these practices by updating with current research – thank you so much. I wish I had many more years in which to help guide clients towards freeing their tensions and opening to wellness. I have used a similar imaging technique when working with victims of sexual abuse and it really helps. Thank you so much . I have always felt we carry something with our bodily pain that is reflective of the burdens we feel in life such as back pain when we feel the burden of caring for so many others.. I am a. Somatic psychologist and I work with clients often who have trauma trapped in theirs bodies and they have physical symptoms from it. I always love to learn mote from the masters like Peter Levine. I am a myofascial release therapist. The idea of tissue memory is implicit in my work. Peter Levine’s dialoguing with Chiam was a helpful example for me for bringing awareness and releasing. Since I started to listen to the series, I observe that many of the patients do have traumas in their history. As an osteopath, every day, I am exposed to possible body memories. My issue is to bring the patients to explore this and not stay in a state of mind that recognizes only a bio-mechanical explanation. I guess, the key here is to keep the patient in the actual experience of the treatment.